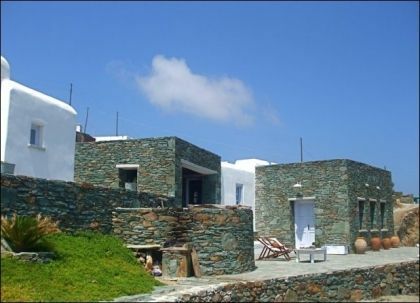 Villas for rent in Folegandros | Luxury Holiday rentals in Greece. What catches the eye immediately in Folegandros is the endless series of "dry-placed" walls that have been erected over the centuries by the inhabitants to create terraces on the sunny slopes of the territory to be able to raise cereals. Folegandros has three small villages, Karavostasi (the port), the Chora, Ano Meria and Agali Beach that are connected by paved roads. Folegandros island harbor's, Karavostasi, also with a few shops and restaurants hosts today several hotels and some of the best of them. In Karavostasi you find a fairly long stoney beach , one beach East of the port and small beaches towards Livadi. From Ano Meria you may walk from 40 to 90 minutes to reach other beaches, among which Agios Georgios, on the North/East.